Nikolay Alekseevich Chebotaru was born in 1948 in the village Gliboke, Odessa region. In 1976 he finished Ilya Repin Republican Art School in Kischinjow. From 1976 to 1979 he worked as a teacher at Children’s Art School in Moldavia. In 1979 Nikolay Chebotaru moved to Sevastopol, Crimea. 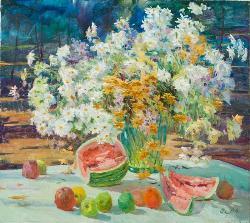 He worked as a painter in art studios in Sevastopol. He participates in national, republican and local exhibitions. In 1982 he became a member of Artists’ Union of Ukraine.